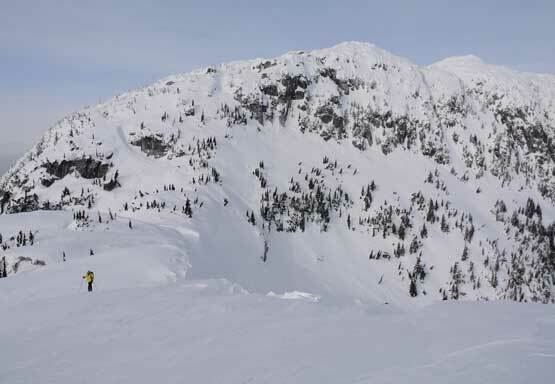 The unofficially named “Puma Peak” is the highest of a bunch of summits immediately around and north of Madeley Lake at the head of Callaghan Valley. 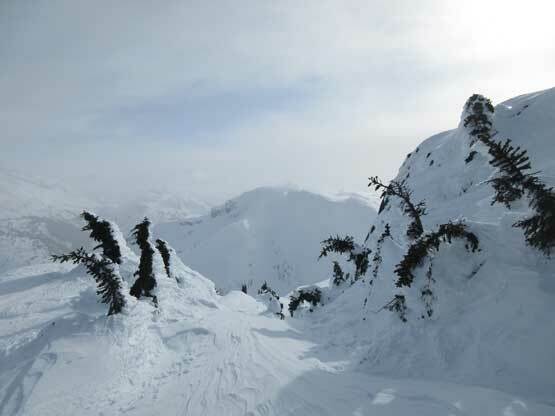 The access is often made from Whistler Olympic Park and this whole area is popular for cross-country skiing with a maze of groomed trails. 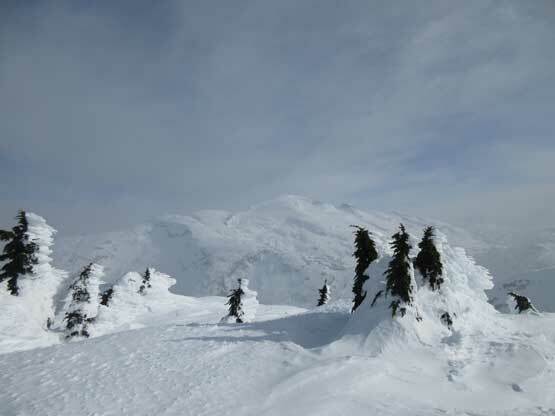 This peak also sees backcountry skiers but most parties stop at the south summit. 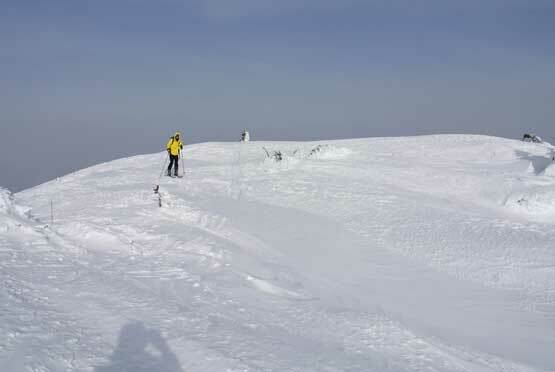 The north (true) summit is only ~15 m taller but requires 3 km round trip with at least 330 m cumulative elevation gain on some complex terrain. The north summit is seldom ascended as far as I know. Alex and Ben had attempted this objective twice and failed both times due to a combination of running out of time and the lack of visibility. Once this was tossed as the objective of this past Sunday I suggested we should park at Alexander Falls parking lot. 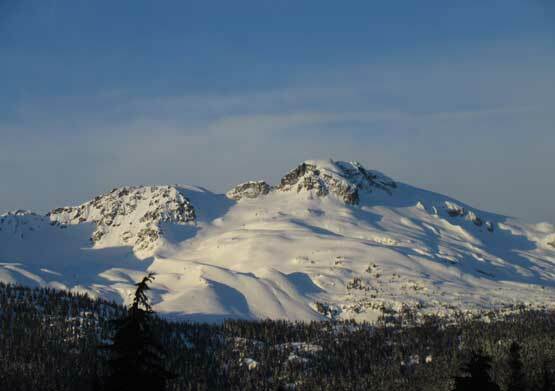 This adds 3 km to the round trip distance but avoids all complication with the logistics of Whistler Olympic Park. We wouldn’t worry about the gate’s hour whatsoever and could start (and finish) at any time we wanted. The ascent of Puma Peak was such a last minute decision that I did next-to-nothing homework including the obligatory weather check. Apparently the weather forecast had downgraded at the last minute but we all missed that. I made to the car-pool in West Vancouver’s church by 5:30 am. Ben, Alex and Daniel showed up shortly after and we were soon on the road. The drive to Whistler was uneventful and as expected, the temperature dipped down to -19 degrees and the traffic sign plates suggested the wind was howling in the valley. We firstly went to investigate the gate and surely it was closed. We then turned around and drove into what seemed like a private parking area maintained by Journeyman Lodge. A guy came over and warned that we needed to purchase some trail-access tickets so screw that. We drove out and parked at Alexander Falls. This added perhaps 10 min of walking each way but who cared.. 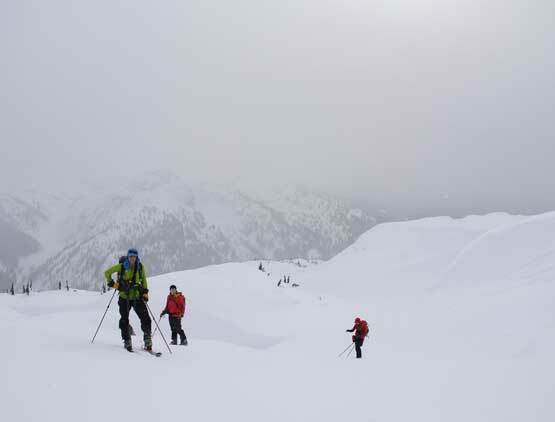 The day started by boot-packing on the Callaghan Valley road for about 200 meters uphill. We opted to leave the road randomly for a short cross-country travel because we didn’t want that guy to see us skinning on their groomed tracks. 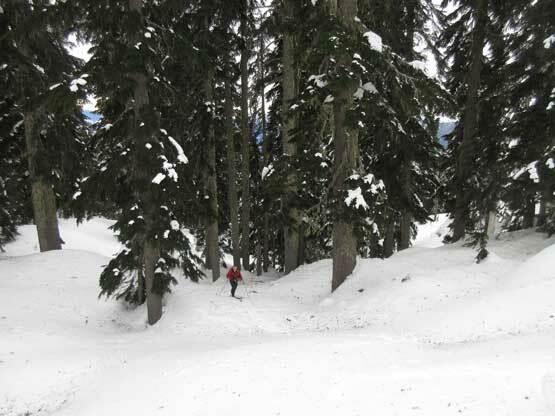 This meant a short bit of bushwhacking but soon we joined the groomed tracks. After a couple junctions navigated mainly by GPS we got onto the maintained Madeley Creek loop. The march down this trail was quite a long and monotonous one and thank to my lack of skiing in the past several years I soon fell behind. 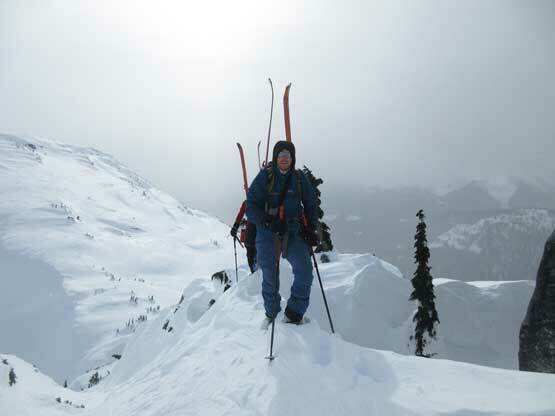 I had no issue with fitness but skinning on a flat, groomed trail needs more than just one’s fitness. 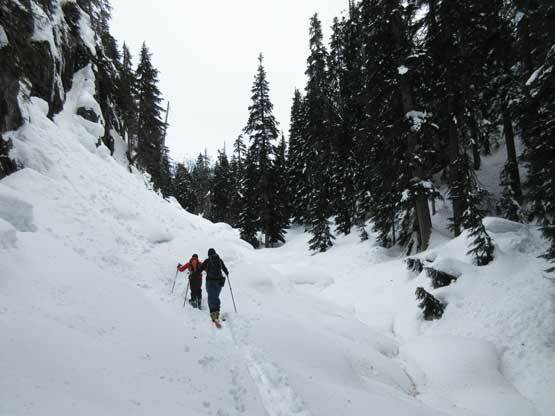 My muscles are too used to plodding on snowshoes that my skinning was very inefficient and my feet had already started developing blisters.. We grouped together at the start of Beverley Creek trail and I was relieved that we finally started gaining elevation. 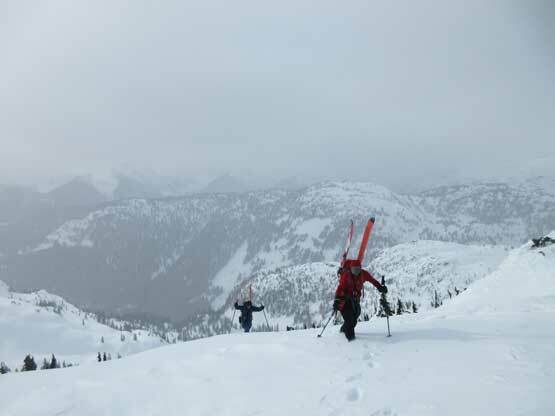 I had no problem keeping up in the steep upwards parts because on these stretches I could rely more on the fitness than the skinning efficiency… The trail was marked by some large orange markers and adding to that we had a well-travelled set of ski/snowshoe track to follow. The snow condition was icy and crusty. After a while the terrain levelled out and another while of flat skinning later we arrived at the “key lake” – at least that’s how it’s named on bivouac.com. 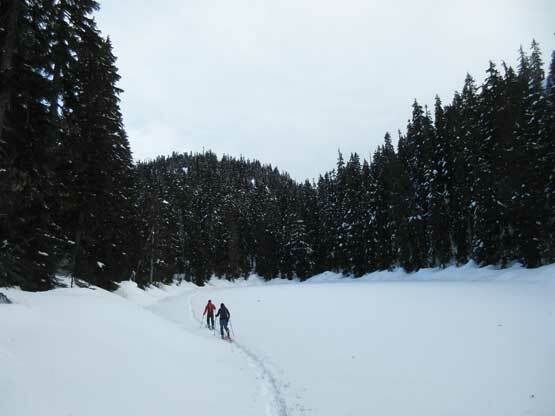 This “key lake” is aptly named that it’s indeed a cross-road for several trails – Madeley Loop, Beverley Creek and Puma South’s winter ascent route. We skinned across the small lake, turned leftwards and soon turned right into the forest once it made sense. Alex and Ben led the way because they had gone up there twice. 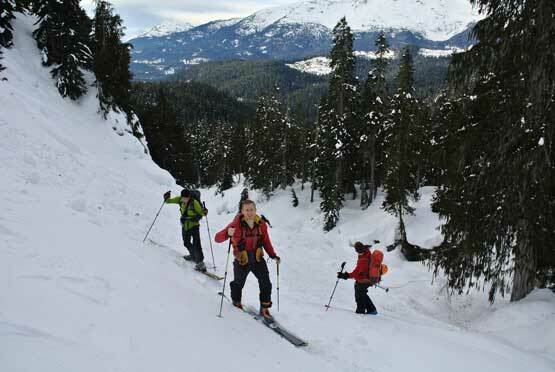 The winter route on “Puma South” is named “Marvelous Ramps” on bivouac.com and I had to agree. 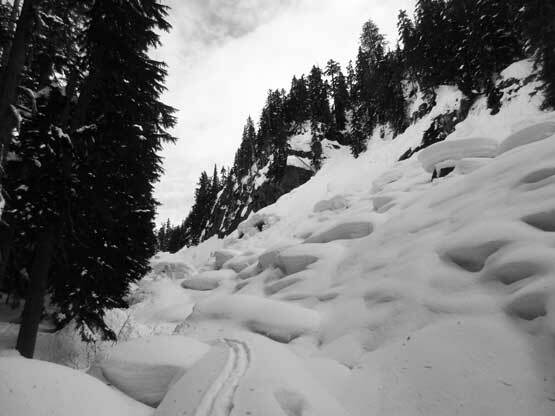 This route is magically linked together by endless ramps and gullies with very minimal travelling in dense or steep forest. 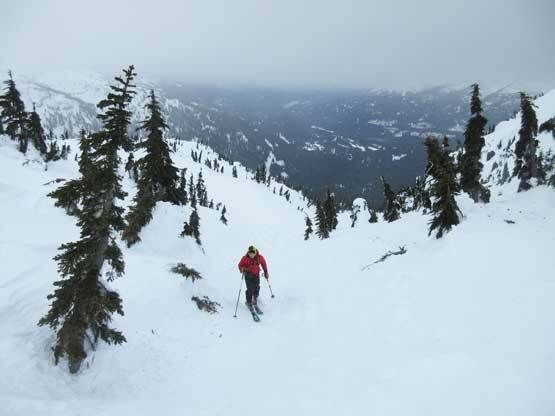 We skinned on climber’s left side in the trees paralleling the first two “ramps” with occasional detours onto the ramps themselves, and didn’t ascend onto the spine of Puma South’s broad south ridge until at 1320 m elevation. Skinning up one of the ramps. Photo by Alex R.
The next stage involved the most amount of forested travel but by west coast’s standard this was nothing. The forest was neither steep nor dense. We followed the GPS track aiming diagonally up climber’s right and came out of the woods at roughly 1450 m elevation into a mini depression zone. 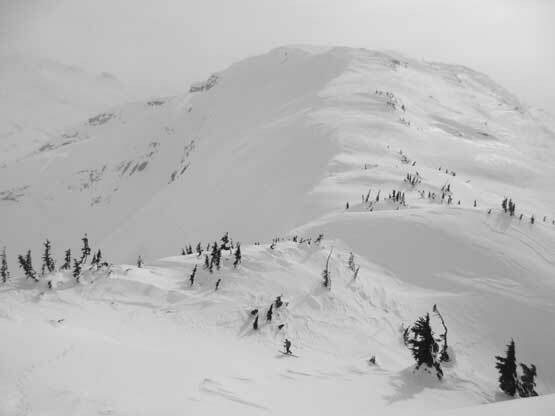 The snow suddenly transitioned to a mixed bag of wind affected batch – breakable crusts, impenetrable crusts, powders and icy surfaces in an unpredictable fashion. The skinning was challenging to say the least. We followed this depression zone continuing due climber’s right for a while until the GPS indicated we had to do a 90-degree left turn into some steep terrain at ~1500 m elevation. 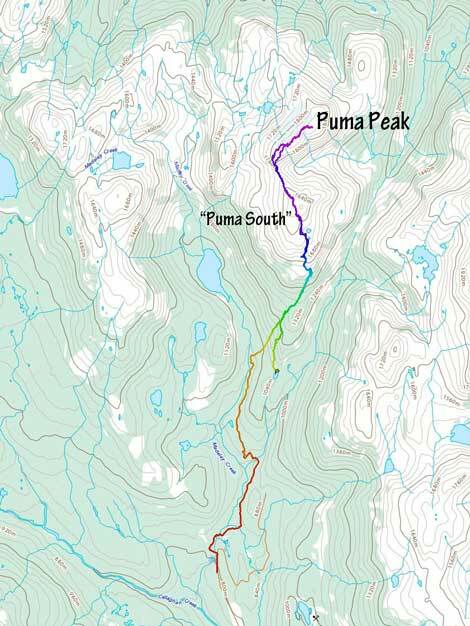 This was the key in the route that linked the lower and upper sections of Puma South’s “Marvelous Ramps” together. 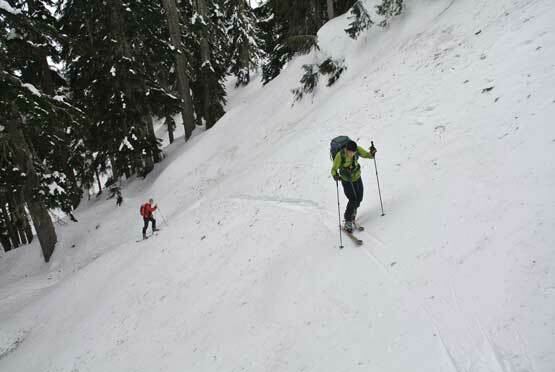 Upon finishing this stretch of steep skinning (didn’t need to bootpack) we took the much-needed first break of the day. Ben skinning in the woods. Me hitting some wind affected zones. Photo by Alex R.
Ben then took over the lead ascending another stretch of steep forest before eventually coming out of the forest below 1650 m elevation. We consulted with the GPS again and decided to stay on climber’s right side into another (wider) depression zone. 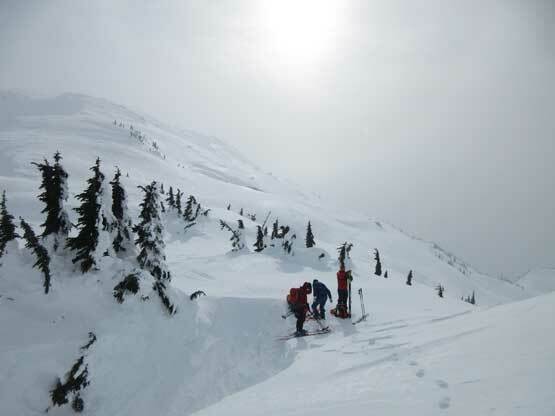 This meant we would traverse into a broad bowl east of the summit area and attack from there. The skinning was still challenging but marginally manageable. The downside was the deteriorating weather. 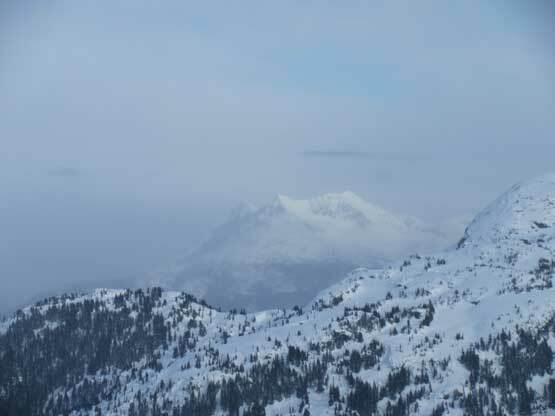 The forecasted sunny skies had never showed up except for the first hour in the morning, and now we were hit by some periodic flurries. I cursed the forecasters as usual. The clouds ceiling seemed high enough that white-out was not a concern, yet. 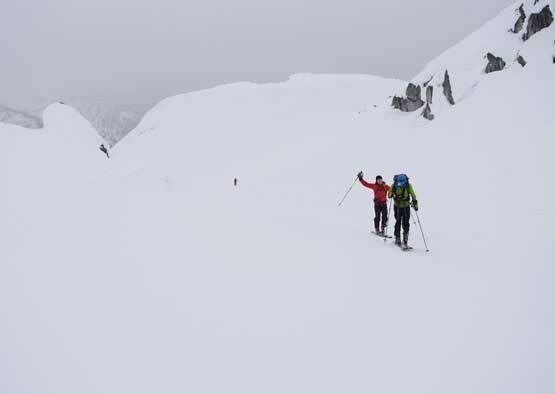 Alex knew the route well and led a couple long and steep traverses out of the bowl in some flat-light conditions and the next thing we were skinning across the flat plateau on Puma South’s summit area. We didn’t bother to tag the actual highpoint because this is just a sub-summit. 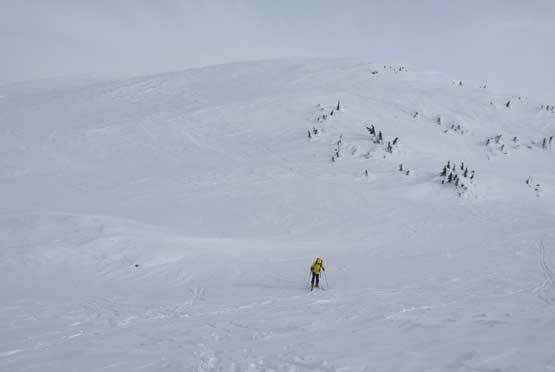 We aimed directly at the NW Ridge and upon seeing the entire stretch down to Puma/Puma South col we decided to rip the skins and ski that 100 m descent. We finally ascended above treeline now. 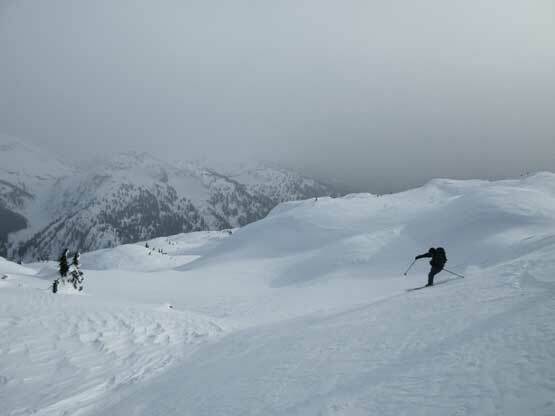 Ben skinning up. 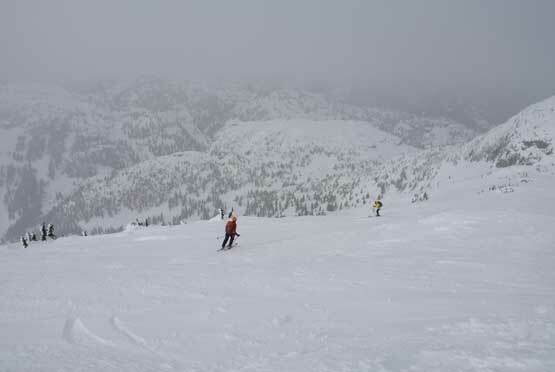 Unfortunately the weather collapsed on us..
Skinning in the east side bowl. 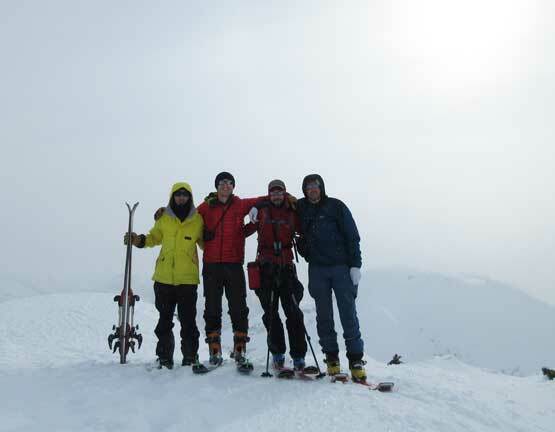 Photo by Alex R.
Another photo of me, Ben and Daniel skinning up. 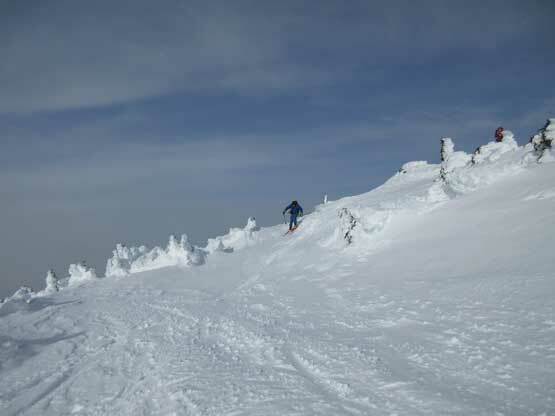 Photo by Alex R.
The skiing was not easy for me but again, marginally manageable that I could actually make a few turns despite the icy condition. In no time we were down to Puma/Puma South col. The ascent out of the col on the north side looked to be more involved and definitely would require some boot-packing, so we strapped the skis on. 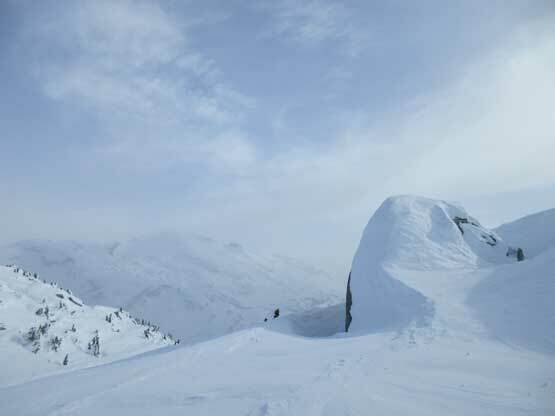 Boot-packing is my favourate part on a ski trip so without hesitating I went ahead to put in some work. 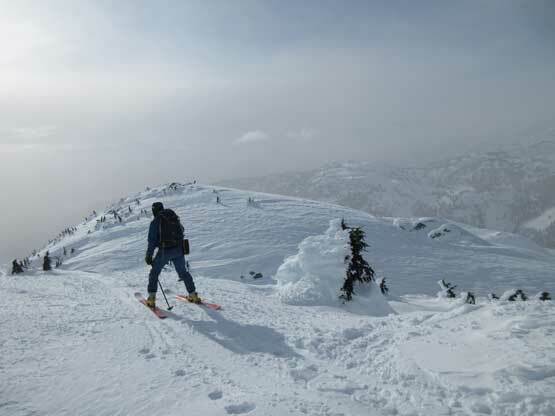 The steep wind-scoop required some hard step-kicking but boot crampons were never needed. We continued boot-packing for a long while until post-holing took over. 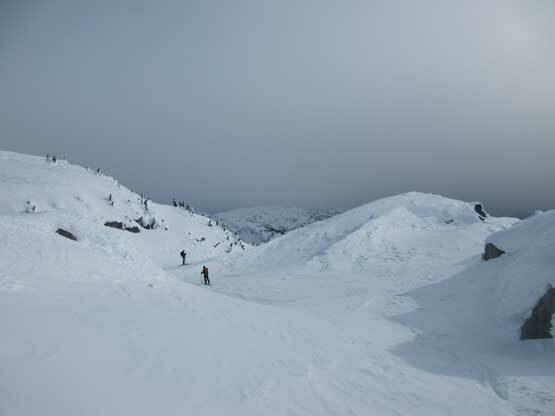 The rest of the ascent involved marching up and over endless false summits. It was difficult to tell which was the actual true summit so we had to tag them all, and because we did that we claimed the farther, north-easternmost summit to be the true one, just so that the future parties all had to traverse there as well. Skis on again and we still had a long way to go. 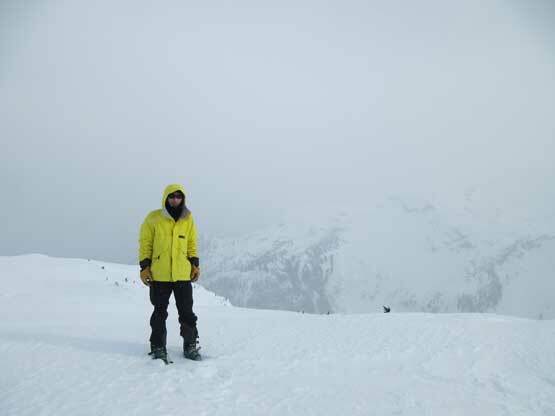 Photo by Alex R.
After taking some obligatory summit photos despite the next-to-nothing visibility we started the descent. 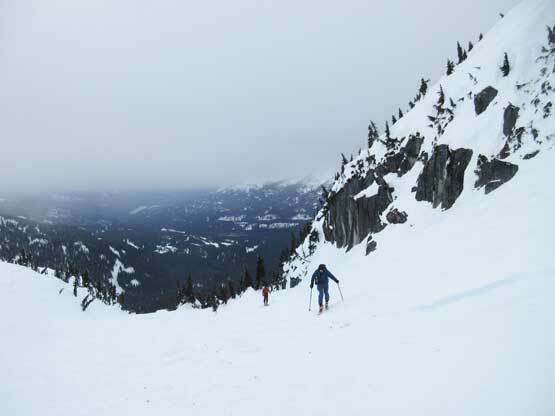 We were running later than expected and I knew the descent wouldn’t be much easier because of my limited skiing experience. 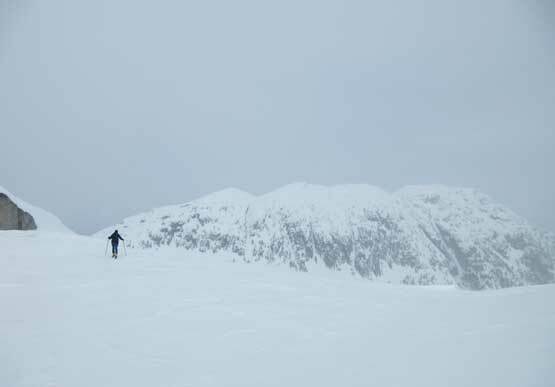 Traversing back across the summit ridge was actually very scenic because weather temporarily improved and even showed us some blue colours. The other guys found a better line traversing around on the north/west side that avoided a few major elevation regains, before skiing a short ways down to Puma/Puma South col. Putting skins back on we had to face that 100 vertical meters of grunt to re-ascend the NW Ridge of Puma South. 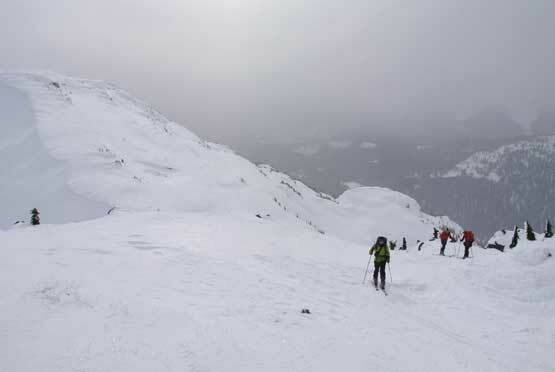 My skins had failed already and offered no edging whatsoever so had to boot-pack a long ways on the upper slopes. It was very tiresome. Me descending one of the many small rolls. Photo by Alex R.
Me re-ascending the NW Ridge of “Puma South” with the north peak behind. 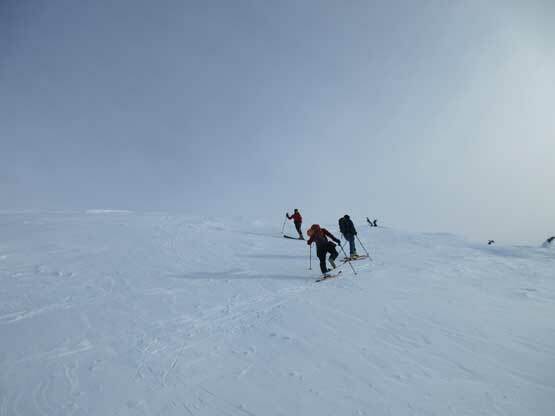 At the summit plateau of Puma South we did the final transition to rip the skins off. The descent was mostly done by following our uptracks. 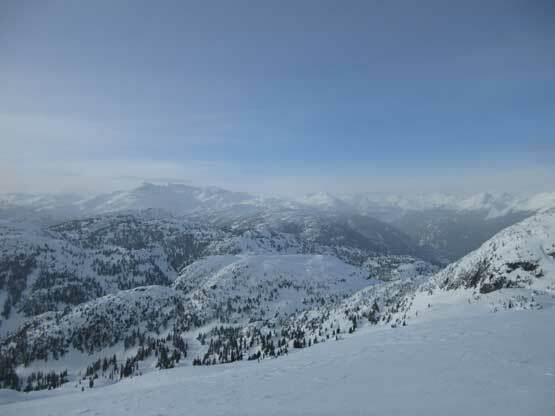 The skiing was brutal to say the least. 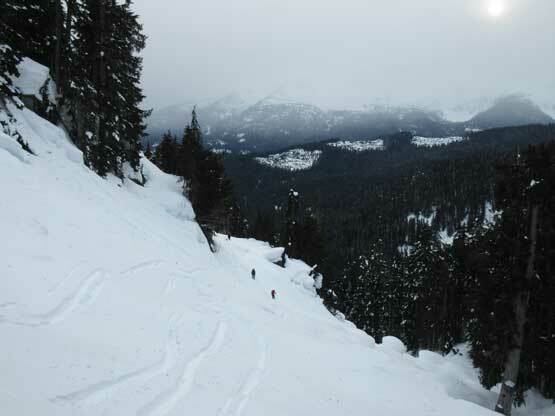 I couldn’t make a turn except for on some isolated stashes of powder or the (homogeneous) icy slopes. Unfortunately much of the snow was not homogeneous at all and I had absolutely no strength left to handle them. 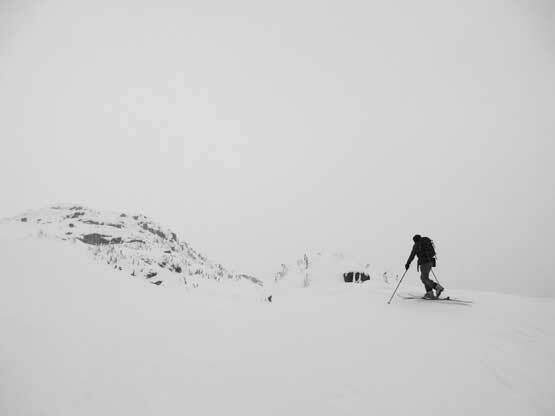 Making kick-turns and “walking sideways with skis on” seemed more efficient so that’s pretty much how I got down. At the lower portion of the “Marvelous Ramps” the other guys decided to short-cut to join Madeley Lake road so I just followed. This involved descending a tight gully full of car-sized boulders. 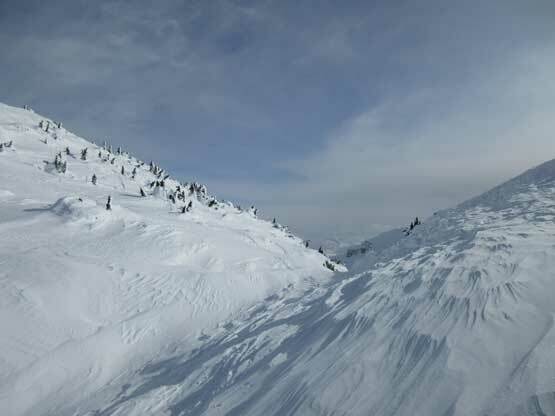 I had to take the skis off for one 2-meter jump but otherwise I did somehow manage to get down with skis on… As slow as it seemed I did manage to not make a single fall on the entire descent so there’s still the bright side. 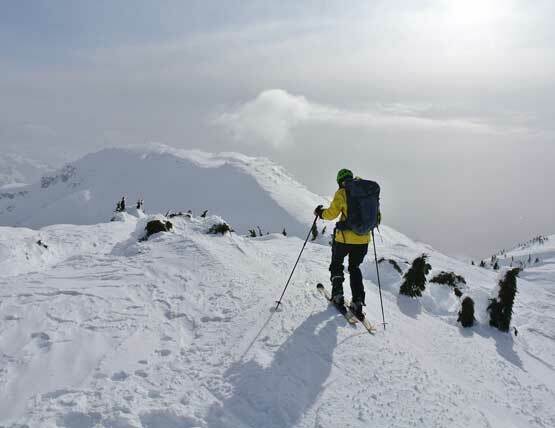 I’m sure I could have snowshoed down this peak much faster but I was happy to put in some ski training. The road skiing weren’t that fluent with several annoying uphill portions. I was too tired to ski uphill without skins so just boot-packed while dragging the skis behind. 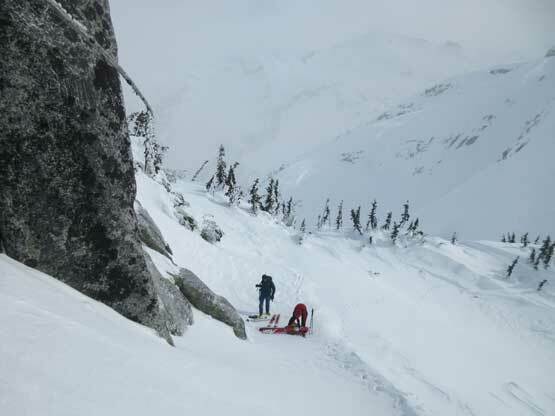 I was bagged and didn’t even have the strength to use my arms to carry the skis down the last 200 m on Callaghan Valley road. 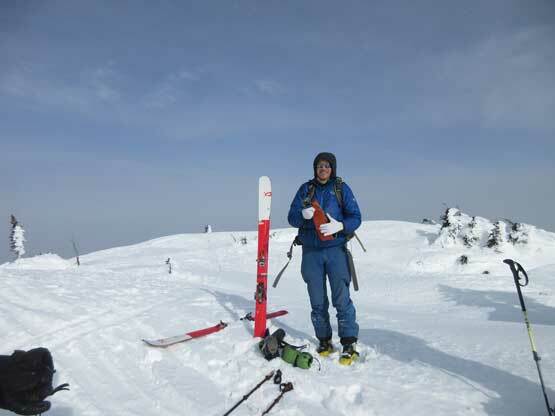 I had to do one last transition to strap the skis onto the backpack. 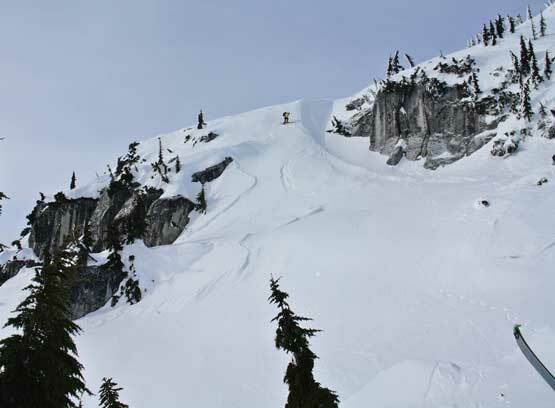 Dropping in the east side bowl of “Puma South”. The round trip time was just under 10 hours (for me) and I’m sure the other guys could have shaved one hour off from the descent. But overall this peak is longer than more involved than one might expect. Had we parked in Whistler Olympics Park we probably wouldn’t have enough time to finish the trip within the gate hours (8:30 am – 4:30 pm) so it was a good decision to park at Alexander Falls overnight lot not having to worry about any logistical complication. 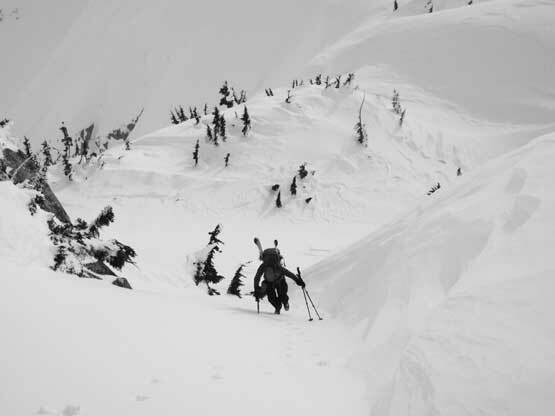 A winter ascent of Puma Peak (North) turned out to be quite a satisfying day.